A loan of $10,000 helped me purchase all of the raw materials I need to make my hat and apparel designs for this year's Kentucky Derby week. I have many materials to buy: hat material, feathers, ribbons, hat boxes, hat racks. I grew up in a tiny town in California, though there was not much opportunity, my mother was continuously running her own small businesses: creative dance classes for kids, summer camps and preschools, and her own massage spa out of her home. Her do it yourself attitude rubbed off on my from the start, and I knew I would never be cut out for a regular 9-5 job. I have always been into fashion, theater, and spectacle, and went to San Francisco State University for costume design and fashion design. I never expected to be a business owner. Having stumbled onto the opportunity to buy a hat shop and learn the trade, I found myself loving business almost more than the act of designing and creating. In San Francisco I also opened a vintage clothing store, that at one time had two locations. It was a great learning experience, I found that I had spread myself too thin. In moving to KY, I learned that hard lesson, and closed my business ventures in California. I definitely have the "serial entrepreneur" syndrome, but now I try to take calculated risks, and am still mainly focused on my hat and apparel business. Last year, I got accepted into the University of Louisville's Entrepreneurship MBA program. It's challenging to balance everything, but I find it so helpful that I can take the concepts I'm learning at school and directly apply them to my business. In the past I would run my businesses on a shoestring budget, never taking out loans or using credit cards, but because of this, my businesses experienced little growth. I now see and understand the importance of raising capital so you can grow your business, and this is what I hope to do in partnering up with Kiva. It supports a woman entrepreneur who has a unique passion for hat making. 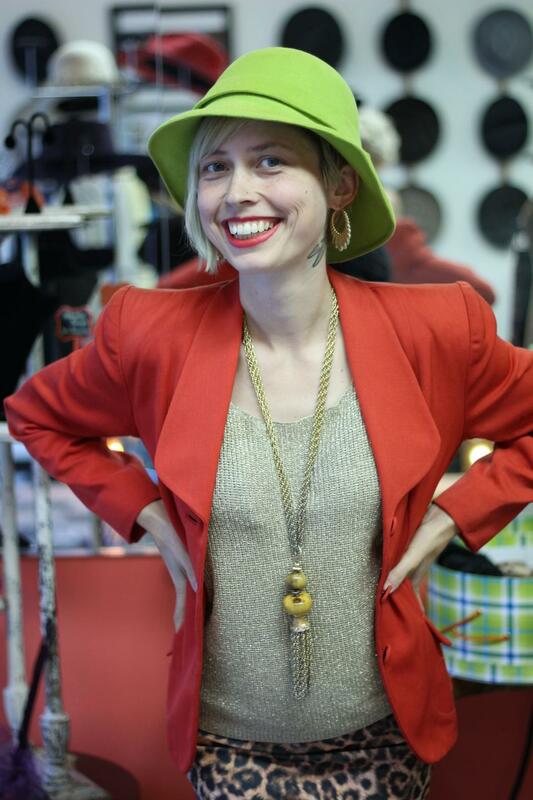 I went to school for costume design and fashion design, I imagined I would be working in theater and film, but the opportunity to buy a 93-year-old hat shop in San Francisco presented itself to me when I was 22 and finishing up college. I got the privilege of apprenticing with the previous owner to learn the antiquated and exclusive art of hat making. I fell in love with hat making, but more importantly fell in love with business. I loved the challenges of growing the business, and the understanding that the success or failure of my business rested on me alone. I transitioned my shop to Louisville, KY, in 2014, I saw an opportunity to take advantage of being in close proximity to the Kentucky Derby, and believed Louisville would be a more cost-effective city with more opportunity to buy a house to raise my family. My biggest challenge is balancing the cash flow for my business, it's very seasonally dependent, and I have to continue to look for new opportunities for my slow months. My future goals for this business is to participate in more art and maker shows in nearby cities, so my brand and designs will be recognized outside of Kentucky. I am proud of my workmanship, my high level of customer service, and my drive to keep trying new things. I don't have any business partners, but I do have an employee who I have been working with for many years. She is incredibly talented, and I am teaching her how to make hats so that my energies can be more focused on marketing and growth opportunities. In order to sell 1 hat, a customer has to be able to try on at least 3 hats; meaning I have to have 3 times as much inventory as I want to sell. According to my calculations taking last year's sales and projected growth into consideration, I will need 125 men's hats, and 200 women's hats completed by the week of derby. Hat materials range from $25 to $100 per piece, not including labor or overhead. Ordering enough straw material will cost $6,000, new hat boxes will run me $2,500, and women's hat materials another $1,500. This is a modest estimate of what I will need. As stated before, the more pieces I have available to try on, the more chances of success with making sales. Furthermore, during the week of Derby I send hats with other people who set up pop-up shops in different local hotels; so I need to have more inventory than just for my store. I hope to double my revenue from last year. This would make a huge impact on my business and my personal life. If I can hit that goal, it will pull out of credit card debt, and provide a cushion for business and personal that will enable me to relax and focus on continuing to grow my business. I am also currently an MBA student, so it's really important that I do well during this season to help supplement the times of the year when I am focusing on my studies. Why are you endorsing Olivia? Olivia is one of my entrepreneurial MBA students at the University of Louisville and she is brilliant! She is one of the most innovative, hardworking entrepreneurs that I've ever met. Her business is thriving and, with this infusion of growth capital, she intends to take it to new heights. I fully and whole-heartedly endorse her for this Kiva loan!